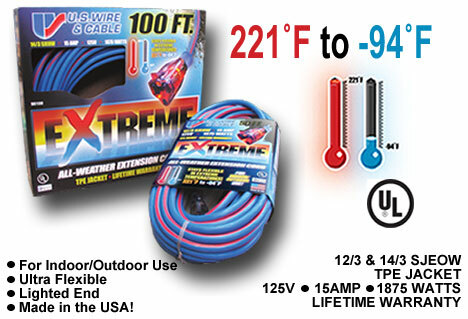 Tested in some of the harshest weather conditions in Alaska, the EXTREME All-Weather Extension Cord is designed for durability to last a lifetime! Maximum flexibility year-round. Includes power indicator light to show when power is on. Indoor-Outdoor use, 15 AMP, 1875 watts. U.S. Wire & Cable.